Eggsy is back! After giving us one of the more clever trailer teases in recent memory, 20th Century Fox has released the first full-length trailer for Kingsman: The Golden Circle. The trailer tease packed a whole bunch of sped up footage into a narrow, 10-second window, but now we can see the actual trailer for Kingsman 2 in all of its glory. 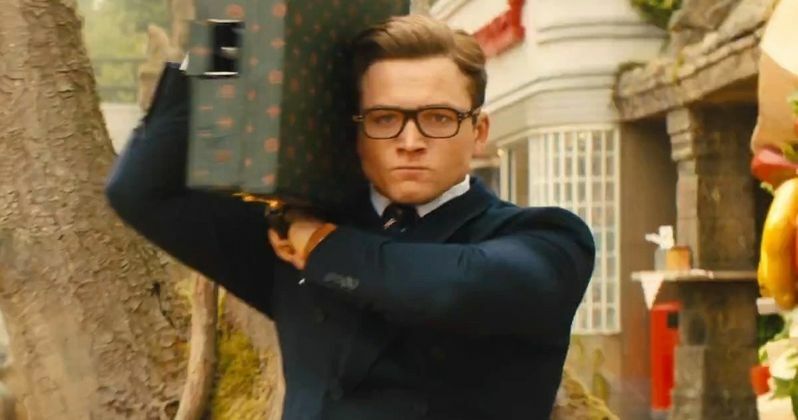 Manners maketh man, and those well-mannered men (and women) also make for a great trailer for what is hopefully an equally great sequel. 20th Century Fox finally decided to release this first trailer for Kingsman: The Golden Circle online after a string of other promotion for the highly-anticipated sequel. Some footage was shown recently to those in attendance at CinemaCon and the reaction to what was shown was largely positive. That got some buzz going and then Fox released some new photos of Halle Berry, Channing Tatum and Jeff Bridges before releasing the recent trailer tease. That left only one thing, which is the trailer we can now enjoy over and over again until the movie finally hits theaters. Here is the official synopsis for Kingsman: The Golden Circle. In Kingsman: The Golden Circle, the Kingsman headquarters is destroyed and the world is being held hostage. That leads the spy's we came to know and love in the first movie on a journey to discover a spy organization in the U.S. called Statesman, which dates back to the same day the Kingsman were founded. The new adventure will push the agent's to their limit, but the two secret organizations manage to band together to try and defeat a new common enemy in order to save the world. Kingsman: The Secret Service was released in 2014 and wound up being a pretty big surprise hit. The movie grossed $414 million worldwide, which is really good when you consider that this isn't a property the general public was familiar with and that it earned a hard R-rating. The movie also did well with both fans and critics, earning a 74 percent approval rating from critics on Rotten Tomatoes and an 84 percent audience rating. Considering that Matthew Vaughn opted to do Kingsman instead of X-Men: Days of Future Past, it shouldn't be all that surprising that the end result was something pretty special. That has set expectations quite high for Kingsman 2, but there is no reason to think that Matthew Vaughn won't be able to deliver. Especially considering all of the impressive new additions to the cast this time around. The excitement is only going to be heightened even more with the release of this first trailer. Let's just hope the movie can actually deliver the goods. The cast for Kingsman 2 includes Taron Egerton, Mark Strong, Colin Firth, Sophie Cookson, Pedro Pascal, Channing Tatum, Julianne Moore, Jeff Bridges, Halle Berry and Elton John. The movie was directed by Matthew Vaughn, who co-wrote the script with Jane Goldman. Kingsman: The Golden Circle is set to hit theaters on September 29. Be sure to check out the trailer for yourself below.